NEWT is on a mission to revolutionize business communications in the Canadian marketplace. With our suite of proprietary voice and data products and services, NEWT is introducing a new way of doing business. Our innovative business solutions provide cutting edge, feature rich, reliable and economical business communications for our customers. 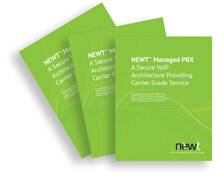 Save Up To 80% With NEWT Managed PBX. NEWT Managed PBX is a business phone system with 80 features, free business phone lines, private network access and continuous support. It can saves businesses up to 80% on their monthly telecom bills. NEWT Managed PBX powered by Fibernetics CLEC, has mastered the ability to offer “business class” service for lower rates than businesses typically pay. When searching for a business phone system it can be hard to prioritize value over cost, and in the past no other service provider has been able to combine those two components, without compromising one or the other. From the minute a customer makes the decision to upgrade to this superior technology, NEWT manages every step of the process. Our expert NEWT support team works with every customer prior to deployment in order to understand their unique business requirements. The NEWT PBX integration, installation and training program is built from the ground up to eliminate pain points and any down time due to a phone system upgrade. Because everything is handled in-house, the NEWT team of experts manage each customer as an individual project. As the carrier, Fibernetics CLEC also manages the number portability requirements well ahead of migration time.